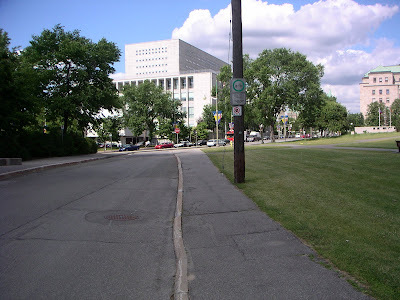 In the last couple of years, many people have observed that the grassed-over lot at the north-east corner of Lyon and Lisgar would make a good place for a community garden. I myself thought so when I was in the area taking photos for the post on 293 Lyon. To my knowledge, the only other community gardens in the Centretown area are the Sweet Willow Organic Community Garden, the Nanny Goat Hill community garden near the Ottawa Tech High School field, one behind Umi Cafe, and the former BUGS garden at the CCOC's Beaver Barracks site, which is on hiatus during the construction of the new housing there. The lot is owned by the Catholic school board, and is adjacent to the CCOC building at 455 Lisgar, where CBC Toronto lives (according to the text on this van, at least!). The lot is fenced off with wooden posts, and an inner row of posts with chains. In between the rows of posts on the Lisgar side is a row of trees. Apparently it was a tough sell to the landowner to plant the trees, but they have taken nicely and are now bearing fruit. In March, I noticed this ghostly face had been attached to one of the posts. Since last year, the Centretown Citizens Community Association's Trees & Greenspace Committee has been working with the City of Ottawa, the Catholic School Board, the Just Food community garden network, and the CCOC to make this garden happen. The Committee's chair, Bonnie Mabee, deserves recognition for taking the lead on this, as does the CCOC's Meg McCallum. They worked out an arrangement among the School board, the City, the CCOC, and the garden, to get insurance coverage for the project, which was the biggest obstacle in getting the school board's permission to use the land. The CCOC will provide water to the garden. The volunteers will be gathering bright and early tomorrow morning to assemble the boxes for the garden's 30 plots. Sorry--they're already all spoken for! Names were taken from the over 100 people on the waiting lists for the other area gardens. A great congratulations and thanks are due to the many individuals and organizations responsible for making this new garden a reality. Good work, everyone! On Monday, July 19, 2010, it was raining, and not lightly. But the sun was mysteriously out while the rain continued. As the Church's website explains, this is actually Ottawa's third Knox Church. The first one was in Sandy Hill. The second, opened in 1874, was on Elgin and Albert. This colourized postcard showing a photograph taken sometime between 1912 and 1915 from the old City Hall shows Knox Church in the foreground, with the still-extant First Baptist behind it on Elgin and Laurier, and Victoria Memorial Museum Building-with tower-in the background. With the current debate on the suggestion renaming Wellington Street in front of Parliament Hill after Sir John A. Macdonald, lots of people are wondering why we've got two Wellington Streets. 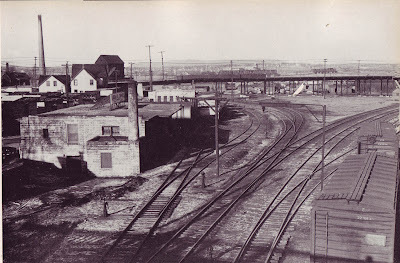 Before Lebreton Flats was razed, there was a bridge over the O-Train tracks connecting the 'middle' Wellington Street to what is now known as Wellington Street West. Here's a photo of that bridge from the Gréber report, with the bridge crossing the image. Behind it, you can also see the Prince of Wales railway bridge over Lemieux Island to Gatineau. The right-of-way for this bridge is still there, going along the North edge of the City Centre building. In the photo below, looking West-ish, the City Centre building is at the left. The O-Train tracks are ahead (not visible), and we can see straight down Wellington West in Hintonburg. After a few blocks, it connects with Somerset Street West. This isn't very intuitive, because Scott Street connects pretty much in line with Wellington/Albert, doesn't it? Well, Ottawa--even downtown Ottawa--is an agglomeration of a bunch of small villages and neighbourhoods that sprouted up pretty independently. 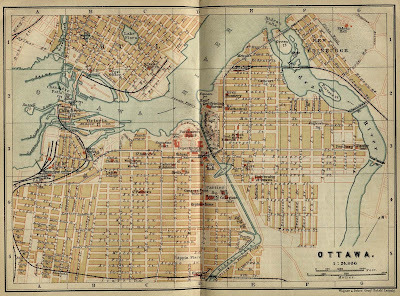 The 1894 street map above (taken from this post on URBSite) shows duplicate street names (like two perpendicular "Arthur"s just blocks apart), often named in different neighbourhoods for the same royalty. Even by this time, the disparate road networks were connected, but it has led to some pretty strange intersections (e.g. pretty much any street crossing Bronson). How does this look big-picture? Well that bridge is on the right in this aerial photo from May 1960. At the left is Nepean Bay, which is much smaller today than it was at the time. If you were to superimpose the Transitway, Ottawa River Parkway and pathways onto this photo, they would go right through the water. This is because it was filled in in the 60's or 70's for various city-building projects. The fill used was landfill (i.e. garbage), which is one of the main reasons it's so hard to get anything built there. Also visible in the photo is the old Canadian Pacific Roundhouse, Lebreton Flats pre-demolition, the temporary buildings on the site now occupied by the Library and Archives Canada, the Alexandra (interprovincial) bridge in the background and buildings pre-dating the Canadian Museum of Civilization, and various former and existing landmarks. And all this to explain why we've got two Wellington Streets. Urbsite has some information on the history of Birkett's Castle in the post on 408 Bank Street.